June 12, 2014, 9 a.m. In the quest for smarter news notifications, NBC News Digital’s Breaking News app will now send alerts specific to where readers — and their phones — are located. By Justin Ellis @JustinNXT June 12, 2014, 9 a.m.
“If the news is that important, it’ll find me,” the saying goes — and in the case of the new Breaking News app, finding you becomes a little more literal. This morning, the popular news service is releasing a new feature called proximity alerts that will allows readers to receive breaking news based on their location. Personalized news is not new — many news sites and apps allow you to choose the topics, places, and people you want to be updated on throughout the day. What’s different with Breaking News is that the alerts are automatically tagged to locations, which can include a neighborhood, a city, a ZIP code, or more. What that means is in the event of a forest fire in California, Breaking News can target that alert for anyone who lives in a specific city or the county. Or in a case like the building explosion in East Harlem in March, Breaking News can send alerts to people within a number of blocks — or all across the city. It’s a kind of passive personalization, designed to let you know if something important is happening near you simply by allowing the app to access your location. Currently, it works only on iOS; Android will follow soon. Cory Bergman, Breaking News’ general manager, said the proximity alerts are another step in their efforts to deliver the most relevant stories to people: “We believe there’s just so much overkill in breaking news today, as an industry. There are so many news alerts. The red bar is permanently burned into the bottom of everyone’s TV sets,” he said. Editors scan wire service reports, live video feeds, and social media to track stories as they develop in real-time, which they turn turn into alerts for the apps and BreakingNews.com. The Breaking News content management system relies on tags to sort stories into topic areas and locations, which editors can use to determine if a story should trigger a proximity alert. The next step is defining the geographic boundaries of a story, said Ben Tesch, creative director for Breaking News. Stories can be connected to multiple areas — so if a train traveling between New York and Washington has an accident, an alert can be sent to both cities, Tesch said. While users can expect more frequent updates on breaking news near them, don’t expect it to be replacement for local news just yet. Breaking News, part of NBC News Digital, has a modest staff of editors covering stories around the globe, which means the proximity alerts may be for big stories that could have a broader significance. Don’t expect to find the kind of day-to-day police or local government stories you’d see in your metro paper or, say, your local NBC affiliate. Anyone who receives news alerts on their phone knows it’s an imperfect science. When it comes to breaking news alerts, most media companies offer little filtering and rely on editors to determine what stories rise to the level of a notification. Primary election results in Virginia’s U.S. House District 7 may not be interesting to you if you’re not into politics — or if you don’t live in Virginia. Alerts from The New York Times sometimes focus on the latest twist in Brooklyn politics, even though most of their readers are far outside the borough. One way to fix that is through user-driven filtering — something Breaking News has been a leader in. (The mute feature is popular because it lets users tell the app what stories or subjects they don’t want clogging up their lock screen — like, for instance, seeing Winter Olympics results before the events have aired on tape-delay.) Location might be another. Geolocation services are not new to smartphones, and place-based features have only improved over the years as things like geofencing have become available. Some apps use your location to tell you where to eat or if your friends are around. Apps like AP Mobile pull in wire stories based on where you are, and Google Now is focused on serving up timely, place-based information. It shouldn’t be surprising that as mobile usage has grown, Breaking News has seen its audience grow as well. Bergman told me most of the visits to Breaking News come through mobile browsers and the app, with a 30 percent overall increase in visitors in the first quarter of this year. As audiences increasingly move more into mobile, Tesch said they hope readers can find multiple uses for Breaking News. Heavy news consumers might use the app to follow significant developing stories throughout the day. But Tesch said it also can be a passive news experience, an app you set and forget, that waits in the background to alert you whenever major news is happening. That’s why getting space on a phone, and adapting to the new ways people follow news, is a big challenge. POSTED June 12, 2014, 9 a.m.
Ellis, Justin. "The notification knows where you are: Breaking News debuts news alerts tied to your location." Nieman Journalism Lab. Nieman Foundation for Journalism at Harvard, 12 Jun. 2014. Web. 18 Apr. 2019. Ellis, Justin. 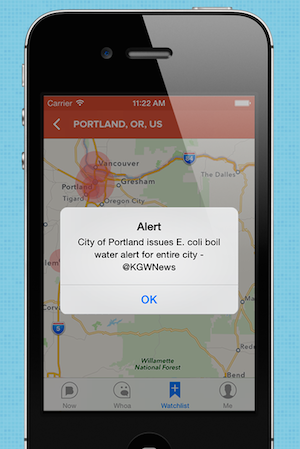 "The notification knows where you are: Breaking News debuts news alerts tied to your location." Nieman Journalism Lab. Last modified June 12, 2014. Accessed April 18, 2019. https://www.niemanlab.org/2014/06/the-notification-knows-where-you-are-breaking-news-debuts-news-alerts-tied-to-your-location/.